We love trying out new rubs that are not found in your local big box grocery store. Small batch or hand crafted seasonings almost always delight us. And sometimes we find a gem. In this case it’s from Houston, Texas in the form of Big Ron’s Rubs. 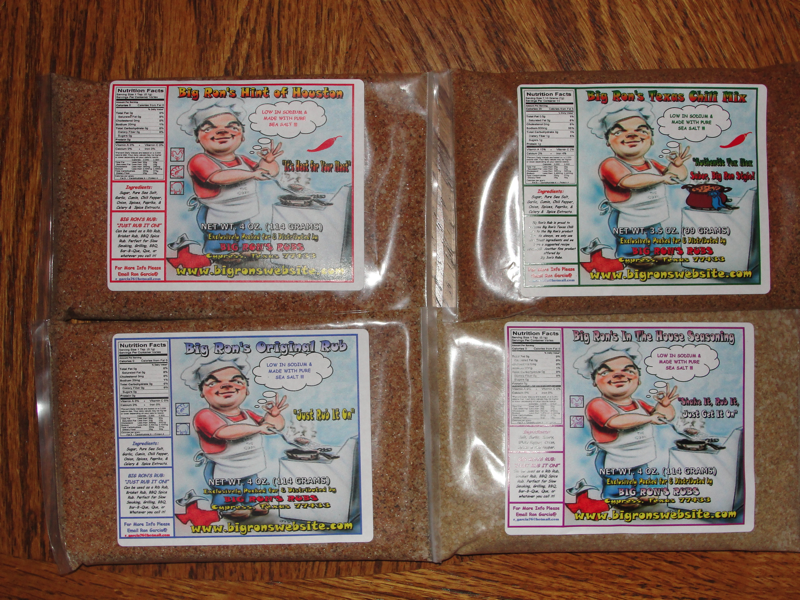 Big Ron Garcia sent us a sampler pack of four rubs – his Original Rub (all purpose), In the House (chicken & beef), Texas Chili Mix (chili), and Hint of Houston (spicy, chicken). It’s the Hint of Houston we are focusing on here. 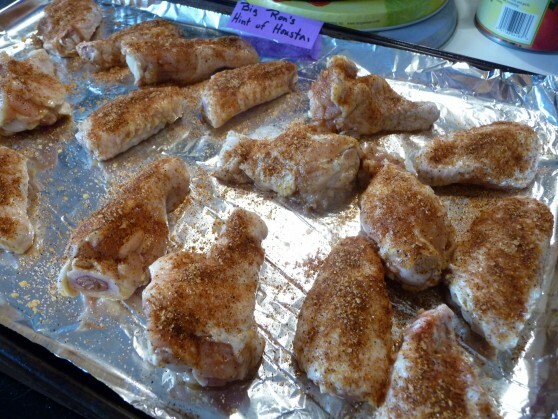 We marinated some wings overnight in beer and a little of the Big Ron’s Hint of Houston Rub. The next day we sprinkled more of the rub on the wings and smoked them for about 2 hours. The wings turned out great by the way, if you’ve never tried smoking wings, give it a go. Delicious and smoky, with the dry rub imparting a great texture and taste. – I got a sense of a true Texas flavor – that of a good bark on a Texas brisket. Maybe it was my brain connecting the Houston name with the flavors I was experiencing. But these wings were dry rubbed, tasty, delicious treats – and a good alternative to your typical grilled or barbecued wings. – The sweetness of this rub really shines through at first, followed by a nice, medium kick of heat from the chili pepper. Marilyn loves how the sweetness doe not permeate the meat, but stays on the outside. I sensed the heat within the meat, so it’s a great balance of sweet versus heat. – While I love the cartoon-ish graphics, the labels are a bit cluttered with so much information within a small space. And there are too many different fonts competing for attention, and too many bits of information that could be spread out over a bigger design. – I give this rub and overall rating of 4 out of 5 stars for the quality of taste and product. No use in deducting points for packaging here, but I do hope that Big Ron’s Rubs packaging matures. 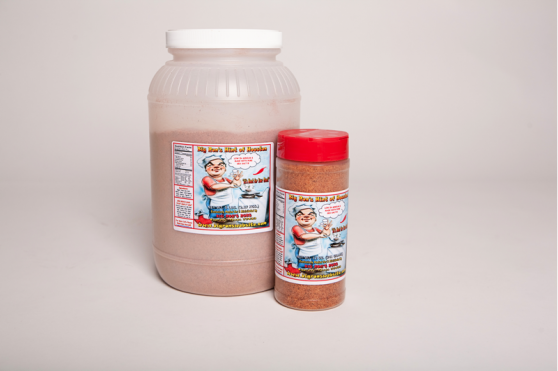 All of Big Ron’s rubs are low in sodium and made with pure sea salt. We look forward to bringing you our thoughts on his other rubs and seasonings soon. 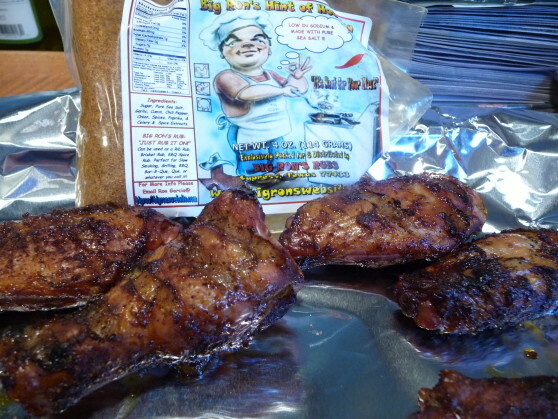 Check out Big Ron’s Hint of Houston Rub at Big Ron’s Website. Shipping is included in all his prices which makes for a great deal for you! Yum, I’ll bet that sugar caramelizing from that rub gives a great flavor. Did these come from the Weber Kettle? How long do the wings go in, and what’s the target temp? We did them on the Weber Smoky Mountain. We smoked them for about 2 hours at 250 degrees. They were crispy and so yummy, with a touch of sweetness. They definitely had some heat! I’d like to add that I “think” we smoked them just a bit too long… by about 10 minutes. I was going by internal temp, but with wings it’s hard to find a piece of meat to get a good temp reading. Next time I would back off by 10 – 15 minutes. But they did turn out sweet and spicy. Really good for a “dry” hot wing. I was impressed. Sounds like a nice wing rub. Hard to beat a nice smoked wing too! As I said, they were our first “smoked” wings, and I can’t wait to do it again. After our Sriracha Wings recipe, these may become my favorite way to cook wings. I’ve been using Big Ron’s rubs exclusively in my BBQ catering business for almost a year now. I started off making my own but I realized that unless I took the time and expense to source the quality spices that Ron does, I would never get the quality I needed. I ordered a sample pack and was hooked. I now buy it it 10lb lots. As far as the graphics goes…?! Give me a break! Ron could hand-write on the jug in magic marker and I would care as long as it’s his high quality spices inside. As a matter of fact, I hope he keeps his website and labels just the way they are. I don’t feel like paying for an upgrade via higher product price.